≈ Comments Off on E IS FOR EXCITING! 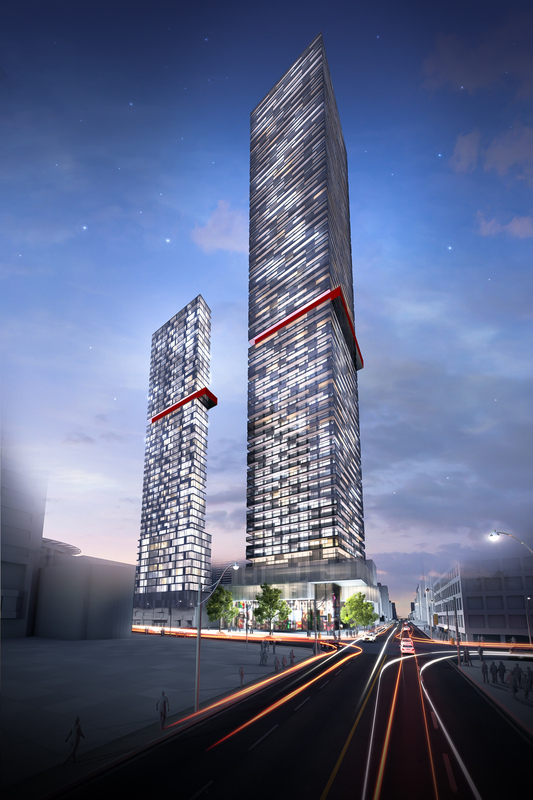 Bazis Inc.’s new E Condos gets AAA+ for its location on the northeast corner of Yonge and Eglinton – one of Toronto’s most significant intersections. Suite owners will enjoy living in the future transit hub for the city. Here is where our Yonge Subway crosses, and where the LRT will intersect. Bazis is developing the condominium with Metropia Urban Landscapes and RioCan, which also operates the Yonge Eglinton Centre across the street. E Condos will feature an underground retail concourse connecting directly to the Eglinton TTC station and the fabulous shopping centre. Every lifestyle convenience you could want is there, and you will not even have to brave the elements to shop, dine, see a movie and run errands. And for even more incredible convenience, E Condos will offer high-end retail venues at its base. The retail section will feature frameless glass walls and 30-foot ceiling heights, creating a stunning environment for shopping. It will be the epitome of sophistication, and so is the design for E Condos. This new condominium’s exterior is the brainchild of renowned architect Rosario Varacalli. The community will consist of two towers, each with a cantilevered glass-enclosed pool extending out from the 31st level. Resembling what you would find in a sleek Miami day club, the fabulous cantilevered pools are a first for Toronto. Imagine the visual and physical sensation of swimming while looking down at the city. This iconic element will have a striking visual impact on the skyline, and the condominium will bring a whole new presence the vibrancy to Yonge and Eglinton! Interiors are by Mike Niven, and that always means the surroundings will be stunning. The condominium will be home to wonderful amenities such as a party room, lounge, kitchen and dining room, fitness room, boxing studio, yoga area – all framed by a wraparound outdoor area for barbecuing and dining. Again showcasing the Mike Niven touch, the will be appointed with luxurious features and finishes, beginning with 9’ ceilings, engineered wood flooring, and Niven-designed kitchen cabinetry with quartz countertops. Registrations are literally pouring in from people of all ages, including many looking to “right size” their space from large homes. Prices will begin from just the mid-$200,000s, which is absolutely phenomenal for this location. If living in this unbelievable new residence appeals, I suggest you register NOW at econdos.ca.